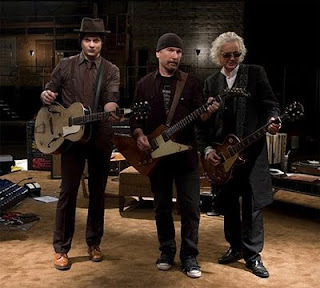 Jack White, Jimmy Page, and The Edge have gotten together to make what looks like a unbelievable documentary about the electric guitar. "It Might Get Loud" is in theaters in New York and LA on August 14th. Jack White has written new music just for the movie that will be his first as a solo artist. Davis Guggenheim who is the director and producer of Academy Award winner "An Inconvenient Truth" is the filmmaker behind the project. This documentary is a glimpse into three of the best guitarist in the world today. Also in the trailer it seems we get to watch Jack White make a guitar out of a coke bottle. Watch the trailer below.